With their fourth annual Art Event collection, IKEA shifted their focus from limited edition two-dimensional works to sculptural pieces. Enlisting eight contemporary artists to each create a design for glass figurine production, one of those recruited was Nathan Jurevicius, the creator of the popular Scarygirl franchise. 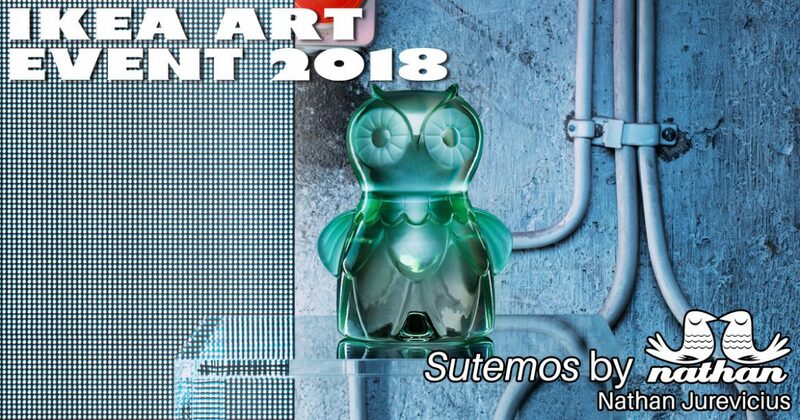 But instead of exploring this well-known universe, Jurevicius introduced Sutemos, an artistic interpretation of an owl from his Peleda world. “I have two signature worlds”, says Australian born freelance illustrator and artist Nathan Jurevicius, referring not only to his internationally successful Scarygirl creation but also his Peleda world. Noting that “the Peleda (owl) world is not tied to other companies and wrapped up in licensing deals”, Jurevicius mentions that “I tend to use the owl universe as a way of escaping my other brand”, further commenting that “there’s a sense of freedom and exploration within it”. Acknowledging how he’s produced “an animated series, games, and art exhibitions that revolved around this animal”, Jurevicius has also “created many owl sculptural pieces”, including his 2008 series of wind-up toys that were simply titled Peleda. With further examples including interpretations on Kidrobot’s Dunny form and the surreally multi-headed Owl Clam vinyl editions, the artists attests that his desire to revisit this avian beast frequently is due to how “its form is very distinct”, adding that it has “an almost human-like quality” as well as “a sense of purpose, calculation, and mysticism”. Viewed in various cultures as either a bad omen, a symbol of wisdom, or even a guide to the afterlife, “I’ve had owls designed in nearly every medium, including vinyl, plush, resin, wood, [and] clay,” says Jurevicius, “but this is the first time using glass”, referring to his IKEA Art Event 2018 contribution. “The art director of the collection [Henrik Most] wanted something he felt was signature to each artist”, according to Jurevicius, “a totem of sorts that could easily be associated back to each creator”. And this perfectly aligned with the artist’s “goal to infuse an owl-likenesses”, as he puts it, “in many of my creations for clients”. “I actually created two owls that were made as prototypes before the final design was chosen”, Jurevicius states. “The first design had two heads that almost looked like a totem pole”, he explains, noting that there “was something tribal about it and otherworldly”. Unfortunately, “it was not coming out of the blown glass mold clearly enough”, the artist laments, “and the top head felt distracting to the overall form”. As for the second prototyped piece, which Jurevicius describes as “a very classic looking design of mine”, “I got to have some brief hands-on experience in glass blowing for this version”, he notes. Ultimately deemed “too expensive to produce in large quantities”, Jurevicius explains how IKEA “were very generous and let me produce that [design] on my own with Målerås Glassworks“, who handmade all the figurines in the Art Event collection. Offering this extremely limited issuing privately in December of last year, the artist had employed “a very cool metallic glaze that could be melted over the hot glass”, as he describes it, creating “a wonderful gradation”. But not only was the design, coloration, and detailing different on this self-produced version, but it also employed a different manufacturing process, each one being “a hollow, blown glass object” as opposed to the IKEA collection pieces, which were solid glass figurines, “made with a 360 degrees mold where the glass is poured in”. For his final contributed design to the IKEA Art Event 2018, it “takes elements from the first owl [prototype] but reduces the complexity down to something very iconic”, Jurevicius says. “I tend to name many of my figures after Lithuanian and Latvian names”, the artist discloses, his grandparents having come from both countries, so “I’ve named this piece Sutemos, which means ‘nightfall’ in Lithuanian”. And while this references the nocturnal nature of owls, Jurevicius mentions that it is also a nod to “my own functional rhythms”, elaborating that “this time of the day is my most creative”. As for the coloration of the piece, both actual colored glass and spray painted decoration options were explored, but Jurevicius states that “for me there was no question it would be green as this is my favorite color”, noting how the “color green appears throughout much of my work and especially my toy/sculpture designs”. The reasoning behind this, the artist describes, is how green “evokes a lot of emotions and themes throughout my life”, continuing onto mention how it “is the color of nature, life, peace, and creativity”. But beyond the coloration and concept of his design, Jurevicius himself fell in love with glass during this project. “No two items, when done by hand”, like these glass figurines, “are 100% exact, which adds to the beauty”, the artist muses. “In fact”, he comments, “some of the minor imperfections you may get fit in well with my other work, with Scarygirl, in the sense that flaws are attractive and add value, individuality, and story to a person or object”. Continue on to Post 9 of 9 in the series “IKEA Art Event 2018”.